The sessions of Sonny Criss for the Imperial label deserve at least as much attention as his better known Prestige albums of the sixties. They show an alto saxophonist of tremendous power and authority. The uptempo standards on Jazz U.S.A. are particularly overwhelming. 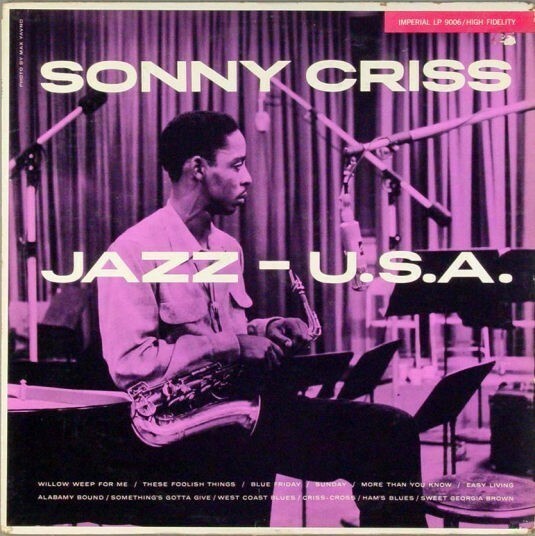 Sonny Criss was born in Memphis, Tennessee in 1927 and relocated to Los Angeles at the age of fifteen. Arguably, the bebop virtuoso’s stay on the West Coast in favor of jazz mecca New York hindered his career. Occasionally, Criss played in Paris, to much acclaim, and cogniscenti and colleagues knew where Criss was at. He took to bebop as early as 1947, playing with Howard McGhee, Wardell Gray and Charlie Parker. Touring with Norman Granz’ Jazz At The Philharmonic brought Criss wider recognition in the California area. In 1955, Criss joined the group of drummer/bandleader Buddy Rich. The three albums that Criss recorded for Imperial in 1956, Jazz U.S.A., Go Man! and Plays Cole Porter (the latter two including Sonny Clark) were first class. But it was an ill-fated cooperation. Imperial was an r&b and country label that released, among others, New Orleans r&b artists Fats Domino, Irma Thomas and Smiley Lewis, and country singers like Slim Whitman. Obviously, jazz promotion wasn’t high on their to-do list. The Prestige albums of the late sixties found Criss laying a thick layer of hard (driving) bop on standards, blues and pop hits of the day. Criss also recorded a couple of solid albums for Muse and Impulse in the mid-seventies. Tragically, in 1977, Sonny Criss committed suicide at the age of 50. The reasons for Criss’ fatal self-infliction by a gunshot remained a mystery for years, until jazz historian Ted Gioia contacted his mother, who revealed that the suffering of stomach cancer had become unbearable for Criss. Criss modelled himself after Charlie Parker (better said, had the chops to model himself after Bird), but developed an unquestionable personal style. The tone of Criss has a compelling vibrato, in contrast to Bird’s more stripped-down sound. Like Parker, Criss is a virtuoso who doesn’t let his technical prowess overrule the message of his music. He’s got an alluring romantic streak in his playing. Precise, driving phrasing, abundant blues feeling and a cocksure beat are striking aspects of his style. Criss tears apart standards with deceptive ease. He plunges himself headlong in the uptempo, swing warhorse Sweet Georgia Brown, topping off ear-catching, punchy lines with salient articulation. Kenny Dorham’s Blue Friday has a swing feeling, contrasted by Criss’ agile, multi-note phrases that he brings about with the finesse of a boxer that stings like a bee and dances like a fly. It’s not brute force that drives you into the corner, but a series of dazzling stabs that leaves one breathless, amazed, admiring. The group, including an elegantly comping Kenny Drew, rises to the occasion on these uptempo tunes. The mid-tempo tunes are more commonplace, certainly as far as the rhythm section is concerned. The combination of Criss and Barney Kessel leads to the album’s (uptempo) highlights, like Sunday, the before-mentioned Sweet Georgia Brown and Criss original Criss-Cross. And Criss and Kessel deliver a flawless unisono theme of Alabamy Bound at breakneck speed, with Kessel lowering an octave at the tag. Kessel’s solo is fleet and vigorating, bebop-swing in full flight. The medium tempo West Coast Blues, a Sonny Criss tune (not to be confused with Wes Montgomery’s tune), is distinctive for the vigorous embellishment of Criss of a generic 12 bar blues pattern. The ballad These Foolish Things has been played to the bone. Criss skilfully embellishes it with twisty-turny phrases, snake-charming the melody with a blend of skill and infectious energy that still inspires awe after all these years.